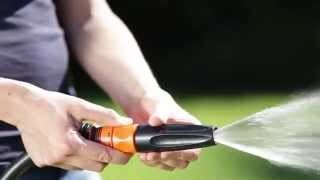 Ergonomic, elegant nozzle allows you to easily and perfectly adjust the jet of water without wasting a drop by simply rotating the cap: from jet to fan spray, depending on your irrigation needs and the type of crop. The cap is equipped with a specific system that prevents it from unscrewing completely to avoid losing it. New-design nozzle with adjustable jet: from closed to open (jet or fan spray). By rotating the ergonomic cap of the nozzle.